Hyderabad city is going to have one of the largest existing temples of “Swayambhu Sri Lakshmi Narasimha Swamy” – renovated and constructed on Road No 12, Banjara Hills. It is going to be a landmark in the twin cities. 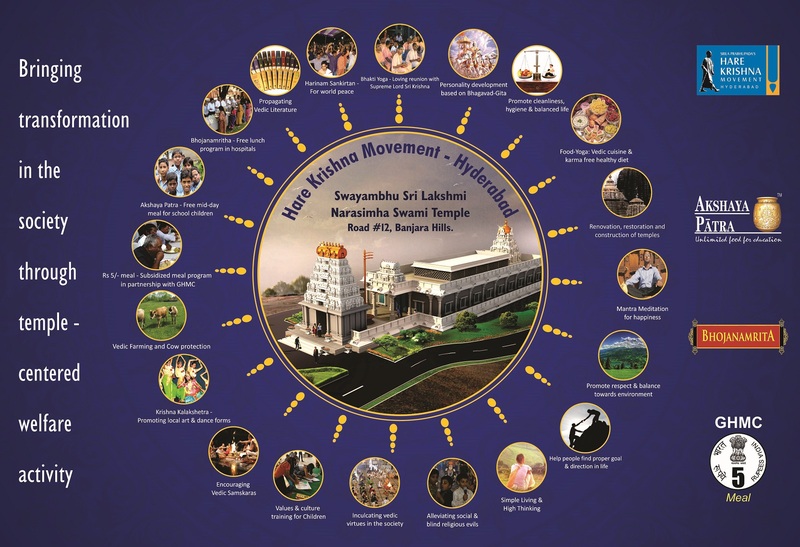 The Hare Krishna Movement (HKM), an affiliate of ISKCON (International Society for Krishna Consciousness) Bangalore, which is into many charity programs has taken up this huge project of renovating and the construction of the ancient temple and monumental cultural complex. The government of AP had allotted a land of 4.38 acres to HKM for the temples development on a long lease basis in the year 2011 and the temple got started its construction work after the Bhoomi puja on 2nd May 2014, on the auspicious Akshaya Tritiya Day; and the focus of the project is to complete the temple in the next 2 years. The proposed overall cost of the project is 100 crore in which it is divided in to two sub phases. Phase I: In the first phase, the renovation and restoration of the existing Swayambhu Sri Lakshmi Narasimha Swamy temple with an estimated cost of Rs 15 crore has already been started and the work is in progress. Phase II: In this phase of development, HKM is planning to construct a monumental cultural complex by investing the 85 crore and this will become the pride of Hyderabad. Also, it is planned to construct Radha Krishna temple in this phase. Overall, the money required for the temples renovation and restoration is estimated Rs 100 crore. If you are interested to be the part of Hyderabad’s history, you may contribute towards the construction of the Hyderabad’s largest temple. Option I: By online money transfer to the below mentioned account. Option-II: Write a cheque with the name “Hare Krishna Movement Hyderabad” and send it to the following address or make a call to 9391773606. The concerned person will come and collect. Option-III: You can visit the website http://hkm-hyderabad.org/seva-donations/ and Donate. You can also download the temple construction proposal here. Needed any further help, please call 9391773606 and get your doubts clarified. Note: People sending cheques; please write From Address so that they generate receipt for the respective Donors. This entry was posted on Dec 2014 at 2:13 PM	and is filed under Hyderabad City Updates. You can follow any responses to this entry through the RSS 2.0 feed. Your Feedback Matters!